Kinesiology/Muscle Response Testing – A method of holding specific pressure points on the body and using a muscle to test for nutritional weakness, used during the Nutritional Consultations. Nutritional Counseling – Teaching the client how to balance their pH, eat healthier and establish proper digestion. A first visit will include: pH test, and kinesiology. A method of studying the iris fibers of the eye to determine tissue weakness and the body’s disposition to weakness. Ear Candling – painless ear wax removal. This technique allows you to relieve your body of all the trauma stored in the head and allows you to move forward in life. Nutritional Counseling is teaching the client how to balance their pH, eat healthier and establish proper digestion. A first visit will include: pH test, and kinesiology. This session will focus on the whole body. The client is fully clothed and this work can relieve back pain and severe headaches, and more. Dr. Bradley Nelson – Quickly and easily rid yourself of damaging emotional baggage and “trapped emotions”. A gentle touch used by the Japanese to instill relaxation and healing. Treats our feet (or hands) to a session of stress reduction and increased body circulation by using the energy pathways located in your feet (or hands). Therapy Room Services @ Health, Naturally! 20 minutes is equivalent to 10,000 steps. E-Power: ELECTRIC ENERGY E-POWER – Activates cells and optimizes metabolism. 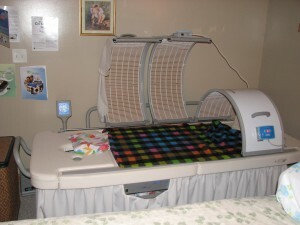 This machine is designed to help balance out the body’s positive to negative ion potential ratio. Advanced ERE (electro reflex energizer) – The ERE helps to relax tense muscles, rapidly offering relief to sore feet using penetrating masage. The ERE stimulates the nerve points in the feet and improves blood circulation. Please call or schedule your appointment online. Services are available by appointment or on a first-come, first-serve basis. Other Services Provided at Health, Naturally! Beth is available at Health, Naturally! twice a month. Call Health, Naturally! to set up an appointment to see Beth. Swedish (relaxing), deep tissue, lymphatic, medical, myofacial, sports and hot stone. Products Available at Health, Naturally!